Eshanette Joseph, a young woman of Wesley has to find more than $47,000 by June 30, 2014 or face consecutive prison terms totalling five years. The woman who will be 23 years old on March 28, 2013 pleaded guilty to theft of $11,218.18 of Linda Hill of St Aroment between December 19, 2010 and May 30, 2011 when she first appeared before Puisne judge, Justice Birnie Stephenson on Tuesday January 15, 2013. State Attorney Clement Joseph told the Roseau High Court on Friday March 1, 2013 when the woman appeared for to be sentenced that her mother worked with Hill when left for the United States in December. Joseph searched Hill's bedroom and in a cupboard found a bag in which reposed her credit card and driver's licence with the pin number for the credit card, and began using the credit card to purchase items of clothing and shoes online, bought and topped up her cell phone, costume jewellery and paid rent on apartments among other expenditures. Mrs. Hill on returning to Dominica in May of 2011 was looking at her Scotiabank statement and noticed some discrepancies. She went to the bank and found that many deductions had been made from her account. The matter was reported to the police; Joseph was arrested and charged, and then pleaded guilty to the offence. 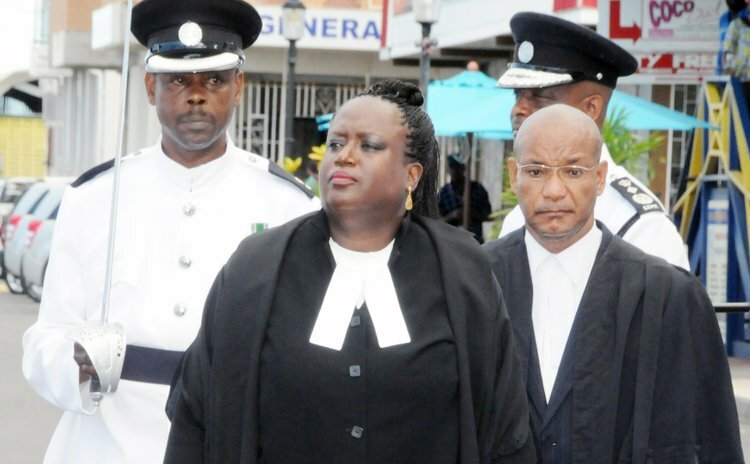 Lawyer Dawn Yearwood-Stewart mitigated on behalf of Joseph. The lawyer noted that the defendant had pleaded guilty at the very first time, at her arraignment in January. The social inquiry report of the Welfare Division indicated that the community of Wesley were sympathetic and had good things to say about the young woman. The actions of the prisoner had not damaged the relationship between the virtual complainant and her mother. Mrs Hill basically wanted compensation. Joseph cooperated with the police. She did not waste the court's time by going through a trial. She was five months pregnant when she was arrested, and the one week on remand had, for her, felt like a whole year of wasted life. She was unemployed. The prisoner had a sister in the United States who was willing to assist her in paying that compensation. Mrs. Hill, asked to take the witness stand, told the court that at no time did the prisoner tell her or tell her mother to her that she was sorry. She purchased some 85 items in the five-month period. "She deprived me of medical care in my old age. I am a widow. She also deprived me of the little interest that would accrue," she said. Justice Stephenson, in deciding on her punishment, noted that Joseph had breached the trust of not only Hill but her mother as well. She had accepted responsibility for her actions. Judge Stephenson told the prisoner that the sentence of the court was four years in prison suspended on condition that the virtual complainant was compensated in the sum of $11,218.18 with interest, at four percent per annum from May 30, 2011 to the date of payment on or before February 28, 2014. The judge also fined Joseph an additional $3,600 to be paid on or before June 30, 2014, and failure to do so would result in one year imprisonment to run consecutively with the four year sentence if that was also breached. The court fine would be reduced by 33% to $2,400 or conversely nine months in prison. Justice Stephenson encouraged the young woman to learn from her experience and to take her life in a different direction.